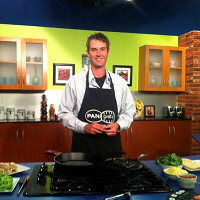 While cast iron has been around for centuries, the creator of Pan Grill-it, Scott Lewis, wanted to bring new ease and health benefits to this tried and true method of cooking. Made in the USA, Pan Grill-it is a cast iron insert designed to fit skillets 12 inches or larger of both the cast iron and stainless variety. It can even be placed inside a Dutch oven or used atop the grates of your backyard grill. Unlike other cast iron pans, Pan Grill-it elevates food preventing it from cooking in its own fat. But what really sets it apart is the fact that it comes pre-seasoned, enabling you to enjoy the taste of cast iron cooking without adding butter or oil. A favorite among chefs for its ability to conduct heat evenly and transition easily from the stovetop to the oven, cast iron is also known for releasing a small amount of iron into your food—welcome news for the many Americans whose diets do not include the recommended amount of iron. From the comfort of your home to the great outdoors, Pan Grill-it brings the flavor of cast iron to the grill and the health benefits of grilling to cast iron. Hi, I'm Scott Lewis. I'm excited to talk with you today about the future of cast Iron cooking! 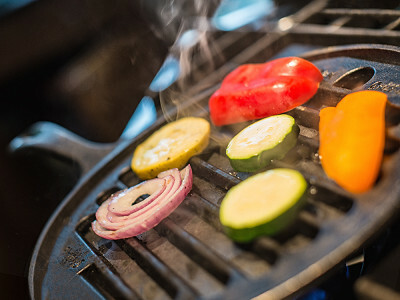 After an empty propane tank ruined a family barbecue, I was determined to find a way to successfully grill indoors and not fuss with all of the grilling tools, propane, and other equipment. But I also discovered that I could bring all the health benefits of grilling to cast iron cooking. You won't need to add nearly as much butter or oil to this insert! Great concept! My cast iron skillets & dutch oven are 10" though, do you have plans to make different sizes? Thanks! @Erica Hi Erica, I have received this questions many time but have no plans to make them smaller. 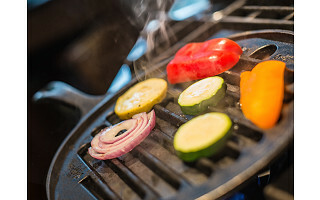 If you place the PAN Grill-it in a larger skilet greater than 12" i.e 17" you can saute'your peppers and onios aound the grill while you grill your fish, steak or chicken. I learned this from a clever cusotmer of mine. Please let me know what product is used to season these inserts. I would need it to be completely vegetarian. @Sherry Hi Sherry, its manufactured by Lodge which they state the following; Seasoning is simply oil baked into the pores of the iron that prevents rust and provides a natural, easy-release finish that continues to improve with use. Seasoning can refer to both the finish of the cookware as well as the ongoing process of maintaining that finish. Lodge uses a soy-based vegetable oil to season our cookware. The oil is highly refined, and all proteins that cause soy-related allergies are eliminated. The oil contains no animal fat, peanut oil, or paints. Some cookware may have slight variations in the seasoning finish. These variations do not affect cooking performance, and typically even out with use. It is very important to maintain the seasoning of your cast iron and seasoned steel cookware by applying a very thin layer of oil after each cleaning. This will help keep you cooking for decades. I hope this was helpful and thannk you for checking out my product. @Scott Can you put a few tiny wet wood chips under/between the grid, to create a smoke as you grill? My mind is going crazy with ideas for using this insert! Gathering a couple friends to get the multiple item discount!! Thanks for creating such a useful addition to my iron collection. While cast iron has been around for centuries, the creator of Pan Grill-it, Scott Lewis, wanted to bring new ease and health benefits to this tried and true method of cooking. Made in the USA, Pan Grill-it is a cast iron insert designed to fit skillets 12 inches or larger of both the cast iron and stainless variety. It can even be placed inside a Dutch oven or used atop the grates of your backyard grill. Unlike other cast iron pans, Pan Grill-it elevates food preventing it from cooking in its own fat. But what really sets it apart is the fact that it comes pre-seasoned, enabling you to enjoy the taste of cast iron cooking without adding butter or oil. A favorite among chefs for its ability to conduct heat evenly and transition easily from the stovetop to the oven, cast iron is also known for releasing a small amount of iron into your food—welcome news for the many Americans whose diets do not include the recommended amount of iron.